Last major update issued on June 25, 2004 at 04:00 UTC. The geomagnetic field was quiet to unsettled on June 24. Solar wind speed ranged between 300 and 350 km/sec. There may have been a weak solar wind shock passing ACE at 04:20 UTC. Solar flux measured at 20h UTC on 2.8 GHz was 108.3. The planetary A index was 6 (STAR Ap - based on the mean of three hour interval ap indices: 6.8). Three hour interval K indices: 21312221 (planetary), 12311111 (Boulder). At midnight there were 3 spotted regions on the visible disk. The solar flare activity level was low. A total of 2 C class events was recorded during the day. Region 10634 was quiet and stable and is rotating over the northwest limb. Region 10635 decayed significantly in the trailing spot section, however, there is still a magnetic delta structure in the main trailing penumbra. 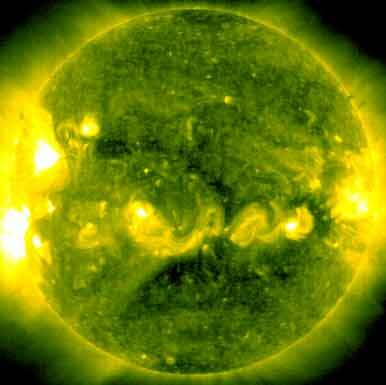 Flares: C1.4 at 05:59 and C1.7 at 06:21 UTC. There may have been a small CME associated with the latter event as a weak type II radio sweep was recorded. [S420] This region was split off from region 10635 on June 19 as magnetograms suggested that this is a separate bipolar region. Slow decay was observed on June 24. Location at midnight: S16W47. June 22-24: Very few LASCO images available. 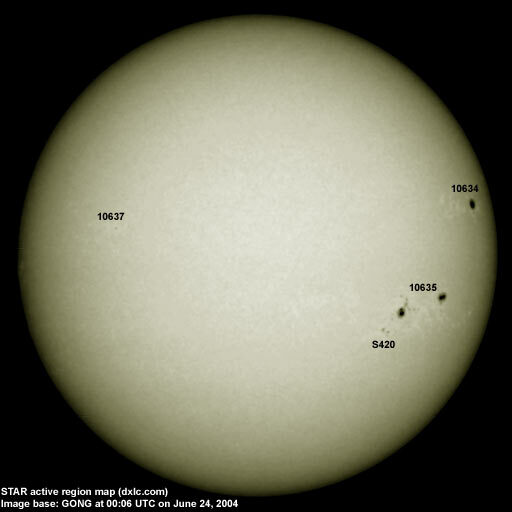 A weak CME may have been associated with a C1 event in region 10635 on June 24. 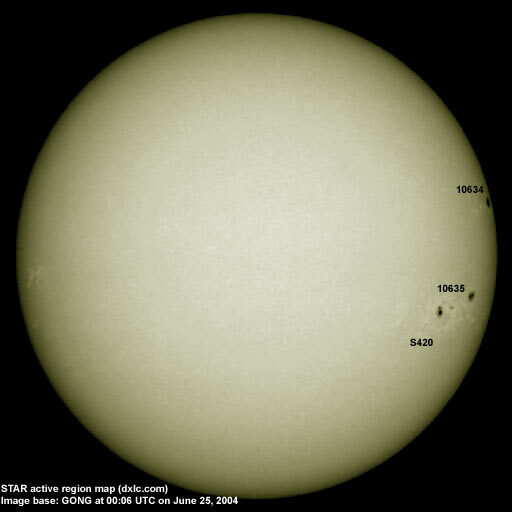 A recurrent trans equatorial coronal hole (CH103) will rotate into a geoeffective position on June 26-27. The geomagnetic field is expected to be quiet to unsettled on June 25-27 and quiet to active on June 28-30 due to a high speed stream from coronal hole CH103. Long distance low and medium frequency (below 2 MHz) propagation along east-west paths over high and upper middle latitudes is poor to fair. Propagation along long distance north-south paths is fair to good. Trans Atlantic propagation conditions are monitored every night on 1470 kHz. Dominant stations tonight: Radio Cristal del Uruguay and Radio Vibración (Venezuela). Brazilian stations had fair to good signals on some frequencies: 740, 760, 930, 980, 1350 and 1440 kHz. Stations from Uruguay were better than one day ago with signals noted on 930, 1440, 1540, 1560, 1570 and 1590 kHz. From North America most of the usual stations from Newfoundland and Nova Scotia were heard with weak to fair signals while 1510 WWZN Boston was the only US station.